Serving breakfast after the bell reaches more hungry students. On May 30, 2018, Governor Phil Murphy signed into law a school breakfast bill that will give tens of thousands more NJ kids a healthy start to their school day. The new law requires schools with at least 70 percent of students eligible for free- or reduced-price meals to provide breakfast during the school day. An estimated 500 schools educating nearly 308,000 students will be required to serve breakfast “after the bell”, according to an analysis by Advocates for Children of New Jersey. Read a primer on the new law. Student participation in the federal School Breakfast Program has increased 81 percent since 2010 – the year before the launch of the New Jersey Food for Thought Campaign. This means that about 110,000 more children are receiving school breakfast each day, pushing the state from nearly last in the nation to 19th in 2017. As a result, New Jersey school districts have more than doubled the federal dollars they receive to provide breakfast, from $47.5 million in FY 2011 to an estimated $110 million in FY 2019, according to state budget figures. 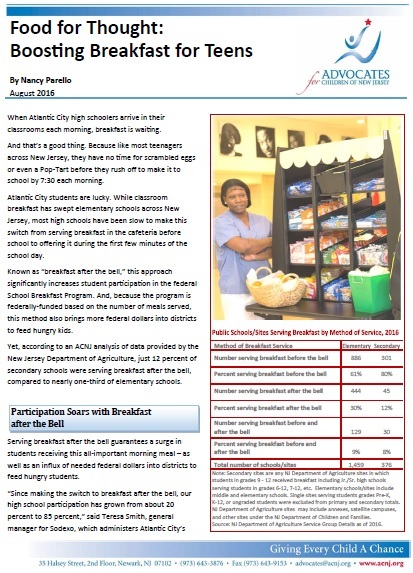 Read New Jersey’s School Breakfast Story. That’s the good news. The bad news is that from 2016 to 2017, schools statewide saw a 2 percent dip in student participation, with many large urban districts showing disappointing double-digit decreases. In fact, in April 2017, about 300,000 low-income children did not receive school breakfast, despite being eligible for and already being enrolled in the program. These students are already enrolled in the program. The problem is that many school districts continue to serve breakfast before school when most children have not yet arrived. When districts serve breakfast before school, many students simply can’t access the meal. Time constraints, transportation, early start times and other issues prevent children and teenagers from getting to school with enough time to eat breakfast before the first bell rings. The solution is simple: serve breakfast during the first few minutes of the school day and offer the meal to all students, eliminating stigma. Known as breakfast after the bell, this approach boosts breakfast participation and ensures that all children begin their school day with the nutrition they need to concentrate and learn. Local advocates can make a difference in their communities by convincing school officials to make this very do-able change to breakfast service. The Food for Thought Campaign, led by Advocates for Children of New Jersey and Hunger-Free New Jersey, encourages parents, teachers, community members and others to use the data, fact sheets, videos and other information on this website to influence change in their own backyards.